Sauces, soups & risotto. Just 3 of the wonderful things that you can make from stock. After consuming our chicken yesterday I have decided to get yet more meals from our tasty bird!. Prices are going up and up and so it only seems right that I leverage every last bit of value from my purchases. 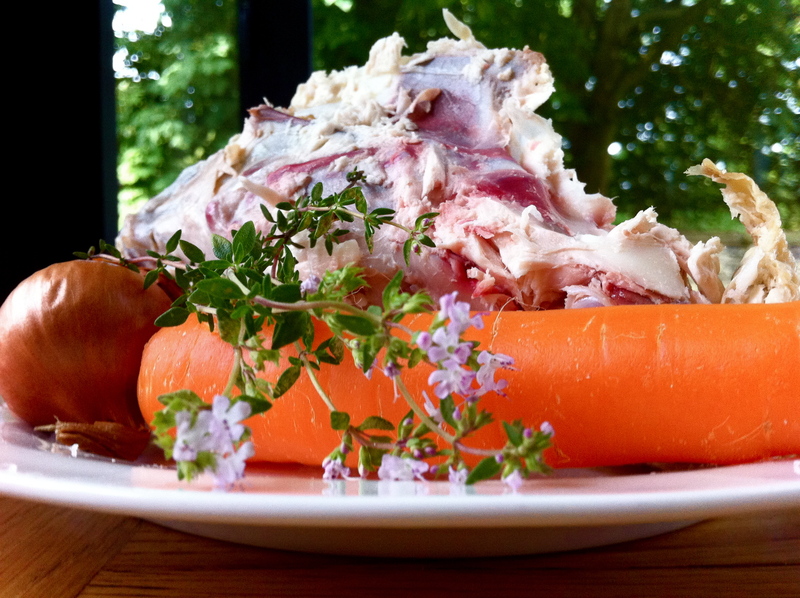 As the photo above illustrates it cannot be any easier – chicken carcass, carrot, shallots and some thyme. Simply put in a large pan with water and simmer gently for a few hours. In fact the longer the better and for me that will be anything up to 8 hours. By that point the chicken carcass has come apart and that tells me it has had a thoroughly good cooking. I’ve added 2 carcasses to this batch. One is from the freezer and is what I had left when I jointed a chicken. Double the chicken means a hefty increase in the punch of flavour. My plans for the stock are to make a haddock and pea risotto for dinner this evening and then I will use the remainder to make a tomato and chili soup. I find that stock cubes are expensive and can be full of chemical rubbish with way too much salt; so I prefer to make my own. Honestly, if you’ve never had a go you will not believe how easy it is and how much wonderful natural, chemical free flavour you will get. If you have any stock leftover or you want to make it last just pour it into ice cube trays. You can use the cubes straight from frozen and add as required. So come on Take Stock and Make some stock. Salads are the perfect summer food and this one is a fantastic sharing dish. 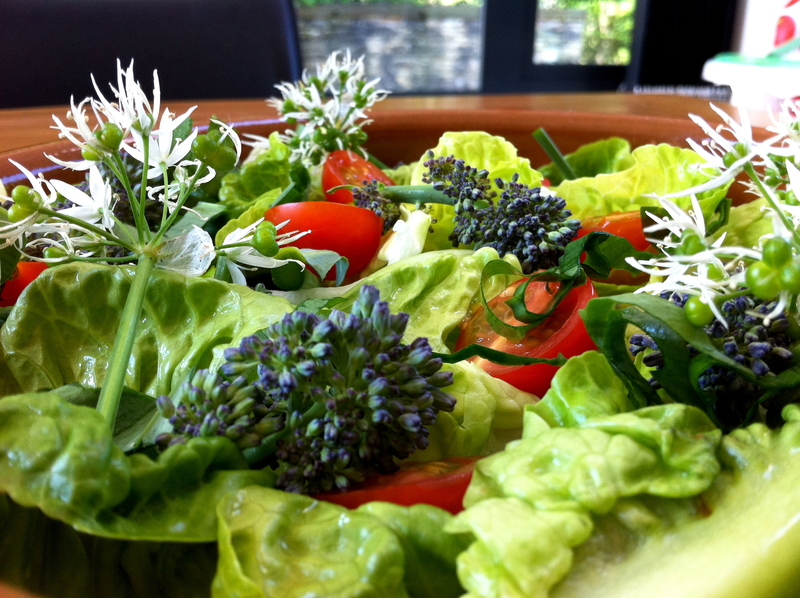 What better occasion to make this simple salad with wild garlic in season. We have the red, white, and blue so patriotic too! On this one, we have some young sprouting broccoli (blue), shredded wild garlic leaves, gem lettuce, tomato (red) and wild garlic flowers (White). The broccoli is raw and has a wonderful sweet and nutty flavour; in addition it is a super food. Purple sprouting broccoli contains the phytochemical sulphoraphane (thought to help prevent cancer) and may provide resistance against heart disease, osteoporosis and diabetes. It is packed with vitamin C and is a good source of caretenoids, iron, folic acid, calcium, fibre and vitamin A. We made a balsamic vinaigrette to go with this using in our opinion, a quite simply awesome balsamic vinegar from Belazu. It’s under £10 at the minute at Sainsbury’s (25% off). If you haven’t tried it then please do. It is a universe and I do mean a universe apart from cheaper balsamic. 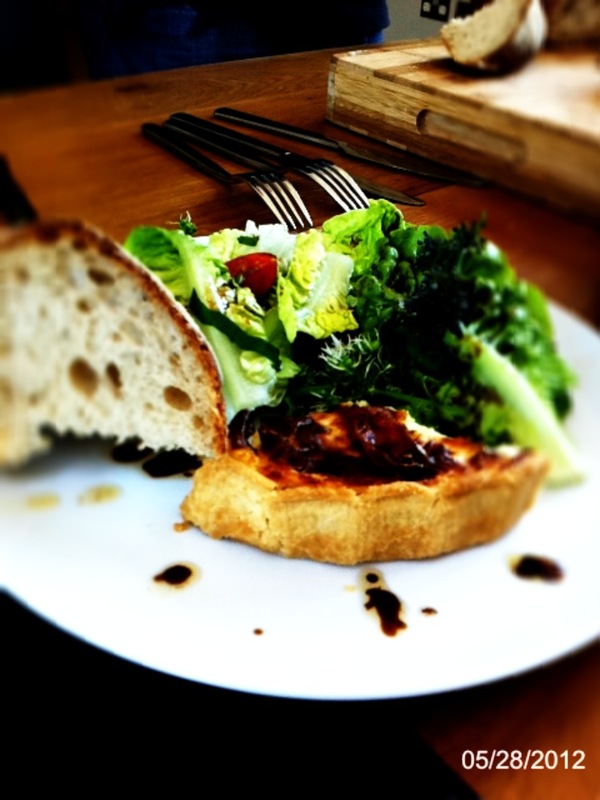 We served our salad with a quiche and crusty bread. Would also work well with grilled meats from the BBQ. Less than 10 minutes to prepare, the garlic is free with a bit of foraging effort, it’s tasty and very good for you. Foraging is Fun – Glorious Wild Food! If you’re looking for something to do at the weekend with the family, look no further! This time of year is fantastic for foraging. Kids love it and you will be able to find a tasty treat to prepare with them and eat. Wild Garlic is a great place to start your foraging journey. It’s so versatile and you can add it to many different things. 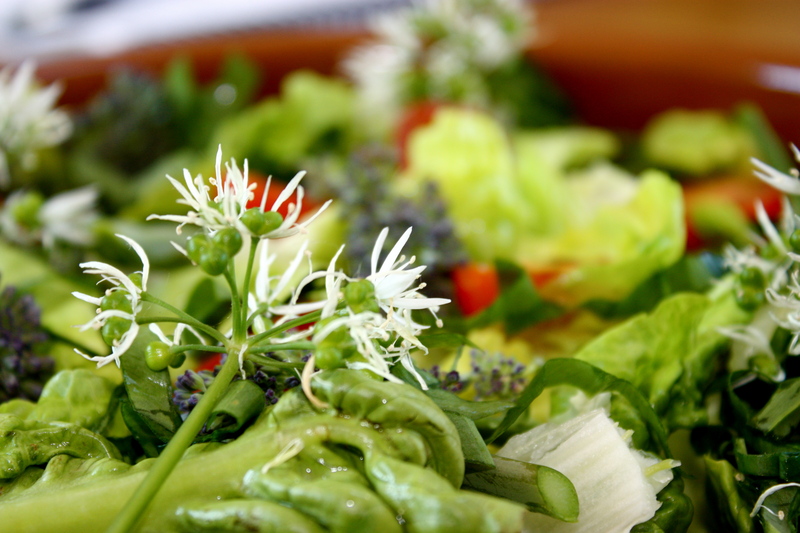 Here, we are using the flowers in a salad with purple broccoli – delicious and ultra healthy. Gardens are starting to blossom at this time of year and so are things like nettles. It makes a wonderful soup! What can you do with left overs? 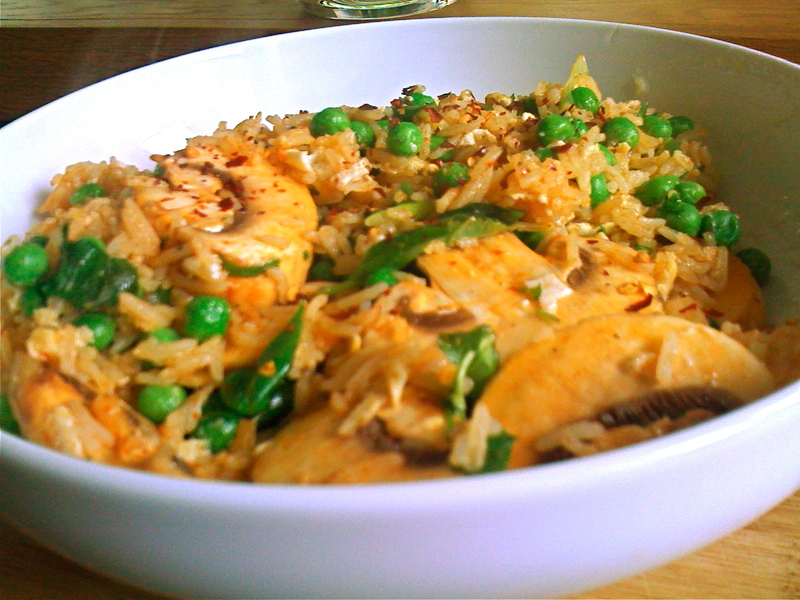 Here is a great tasty recipe, Nasi Goreng. It’s a fried rice dish that is popular in Indonesia and Malaysia. It’s really fabulous to eat, quick to make and turns leftovers into a tasty dinner. There are many different variations to this dish and so if you don’t have all of the ingredients… hey, it’s still gonna taste great! We’ve got prawns and chicken in this version but you could omit these and add in your favourite roast veg instead for example, to make a vegetarian alternative. Nasi Goreng is also a good healthy dish that is loved by many people around the world, including President Obama. The wonderful mix of flavours and the simplicity of making it will mean that this will be a dish you will be adding to your repertoire! Heat 1 tbsp oil in a large non-stick pan or wok. Pour in 1/2 the beaten egg to make a really thin omelette, then slide out. Repeat, then roll both omelettes up together and shred. Heat another tbsp oil and cook half the chilli, the shallots, garlic, and mushrooms for 4 minutes. Add the rice, chicken and prawns and cook for another 2 minutes. Stir in the peas. Mix the brown sugar with the soy and the chilli sauce until dissolved, then stir through the rice. Pile onto a serving dish and top with the omelette rest of the chilli. Drizzle with sesame oil to finish.